State tax policy can be a contentious topic, but in recent years there has been a remarkable level of agreement on the gasoline tax. Increasingly, state lawmakers are deciding that outdated gas taxes need to be raised and reformed to fund infrastructure projects that are vital to their economies. [Read ITEP’s latest brief How Long Has It Been Since Your State Raised Its Gas Tax?] In total, 27 states have raised or reformed their gas taxes since 2013. That number could soon rise to 28, depending on the outcome of a 10-cent increase Missouri residents will vote on in November. 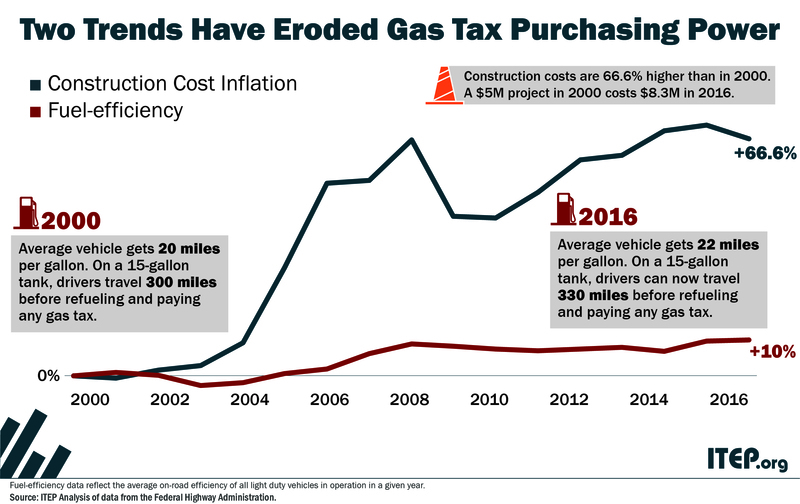 These actions are helping reverse losses in gas tax purchasing power caused by rising construction costs and improvements in vehicle fuel-efficiency. And a growing group of states has decided not just to fix past problems, but to plan for the future as well. 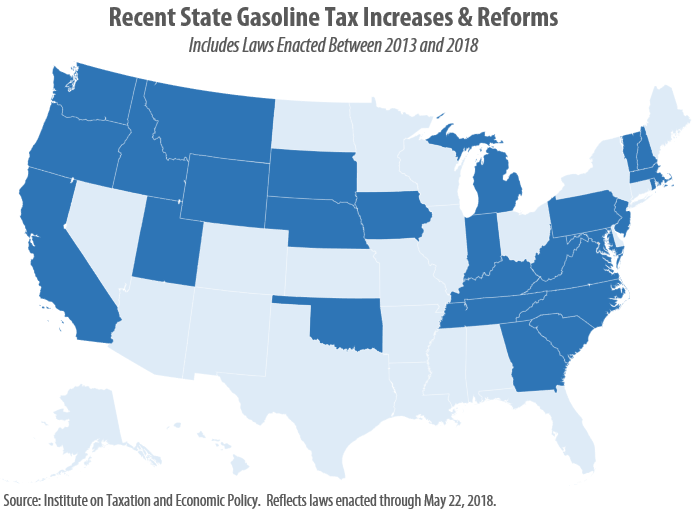 These states are abandoning fixed-rate gas taxes (stagnant, cents-per-gallon taxes) and opting for smarter, variable-rate gas tax structures that will allow them to raise sustainable gas tax revenues for the long haul. A summary of gas tax increases and reforms enacted since 2013 is provided below. Oklahoma: The gas tax will rise by 3 cents and the diesel tax by 6 cents on June 27, 2018. This will be the state’s first gas tax increase since 1987. While the revenue raised by this change will be directed toward the state’s transportation infrastructure, an equivalent amount of general fund money that was previously being used to fund transportation will be rerouted to teacher pay raises instead. California: A 12-cent gas tax increase and 20-cent diesel tax increase took effect on Nov. 1, 2017. The new law also changes the formula that California uses to implement ongoing gas tax rate adjustments. Among those changes are a new provision allowing for gas tax increases based on the rate of inflation within the state’s borders. An initiative on California’s November ballot will allow voters to decide whether these increases will remain in effect. Indiana: A 10-cent increase took effect on July 1, 2017. Further adjustments will occur between 2018 and 2024 based on a new formula that considers both inflation and the rate of growth in Indiana’s personal income. The new law also shifts the portion of sales tax revenue collected on gasoline purchases out of the general fund and toward transportation instead. Oregon: A 10-cent increase will take effect in four stages, starting with a 4-cent increase that took place on Jan. 1, 2018, and ending with a 2-cent increase on Jan. 1, 2024. South Carolina: The legislature overrode Gov. Henry McMaster’s veto to enact a 12-cent-per- gallon increase in the tax rate on both gasoline and diesel. The increase will be phased in over 6 years, with the first increase (of 2 cents per gallon) taking effect on July 1, 2017. Tennessee: The gas tax rose by 6 cents and the diesel tax by 10 cents on July 1, 2017. While Gov. Bill Haslam initially proposed indexing the state’s gas tax rate to inflation, this reform was not included in the final package passed by the legislature. Utah: A new law modifies the variable-rate gas tax formula enacted by Utah lawmakers in 2015 in a way that will allow for somewhat more robust revenue growth. The new formula is expected to result in a roughly 0.6-cent-per-gallon tax increase in 2019 and a 1.2-cent increase in 2020. West Virginia: The gas tax rose by 3.5 cents on July 1, 2017. Because West Virginia’s fuel tax rates are tied to the price of gas, they have fallen since 2014 and have become stuck at their minimum “floor” amount. The new law increases that floor. New Jersey: A 22.6-cent per gallon increase in the gasoline tax took effect on Nov. 1, 2016. The diesel tax rose by 26.7 cents under a two-stage increase that took effect on Jan. 1 and July 1, 2017. Moving forward, New Jersey’s gas tax rate will vary based on a formula designed to raise a target amount of revenue. Georgia: A 6.7-cent increase took effect July 1, 2015. A new formula for calculating the state’s tax rate will allow future rate increases alongside inflation and vehicle fuel-efficiency improvements. This will allow the tax to retain its purchasing power in the years ahead. The first such increase (0.3 cents) under this formula took effect on Jan. 1, 2017 and the second increase (0.5 cents) took effect on Jan. 1, 2018. Idaho: A 7-cent increase took effect July 1, 2015. Iowa: A 10-cent increase took effect March 1, 2015. Kentucky: Falling gas prices nearly resulted in a 5.1-cent gas tax cut in 2015, but lawmakers scaled that cut back to just 1.6 cents by setting a minimum “floor” on the state’s gas tax rate. The net result was a 3.5-cent-per-gallon increase relative to previous law. Michigan: The state’s gasoline and diesel taxes rose by 7.3 cents and 11.3 cents, respectively, on Jan. 1, 2017. Beginning in 2022, the state’s gas tax will begin rising annually to keep pace with inflation. Nebraska: A 6-cent increase was enacted over Gov. Pete Ricketts’ veto. Nebraska’s gas tax rate is rising in 1.5 cent increments over four years. The first three of those increases have taken effect and the final increase will be implemented on Jan. 1, 2019. North Carolina: Falling gas prices were expected to trigger a gas tax cut of 7.9 cents per gallon, but lawmakers scaled that cut down to just 3.5 cents, resulting in a 4.4 cent increase relative to previous law. Additionally, a reformed gas tax formula that takes population and energy prices into account will bring further gas tax increases in the years ahead. The first of those increases (0.3 cents) took effect on Jan. 1, 2017 and the second (0.8 cents) took effect on Jan. 1, 2018. South Dakota: A 6-cent increase took effect April 1, 2015. Utah: A 4.9-cent increase took effect on Jan. 1, 2016. Future increases will occur under a new formula that considers both fuel prices and inflation. This formula was modified under legislation enacted in 2017 to allow for faster gas tax revenue growth. Washington State: An 11.9-cent increase was implemented in two stages: 7 cents on Aug.1, 2015, and a further 4.9 cents on July 1, 2016. New Hampshire: A 4.2-cent increase took effect July 1, 2014. Rhode Island: The gas tax rate was indexed to inflation. This resulted in a 1-cent increase on July 1, 2015, and will lead to further increases in most odd-numbered years thereafter. Maryland: A significant gas tax reform, which tied the tax rate to inflation and fuel prices, was implemented in stages starting on July 1, 2013. Since then, the state’s tax rate has increased by 10.3 cents above its early 2013 level. Massachusetts: A 3-cent increase took effect July 31, 2013. Pennsylvania: A significant gas tax reform, tying the rate to fuel prices, took effect in stages starting on Jan. 1, 2014. As a result of this reform, the gasoline tax rate has increased by 26.4 cents per gallon while the diesel tax has increased by 36 cents. Vermont: A 5.9-cent increase and modest gas tax restructuring took effect May 1, 2013. Since Vermont’s gas tax rate is linked to gas prices, however, the actual rate has varied since then. Virginia: As part of a larger transportation funding package, lawmakers raised statewide diesel taxes effective July 1, 2013, as well as gasoline taxes in the populous Hampton Roads region. Outside of Hampton Roads, gasoline taxes are 1.3 cents lower than they were before the reform, but a new formula included in the law will cause the tax rate to rise alongside gas prices in the years ahead. Wyoming: A 10-cent increase took effect July 1, 2013. Gov. Matt Mead’s signature on this increase made Wyoming the first state to approve a gas tax increase in over three and a half years (no state enacted a gas tax increase in 2010, 2011, or 2012). District of Columbia: Legislation approved in 2013 has yet to impact Washington D.C.’s gas tax rate in practice, though by tying its tax rate to fuel prices the District opened the door to potential gas tax rate increases in the future.